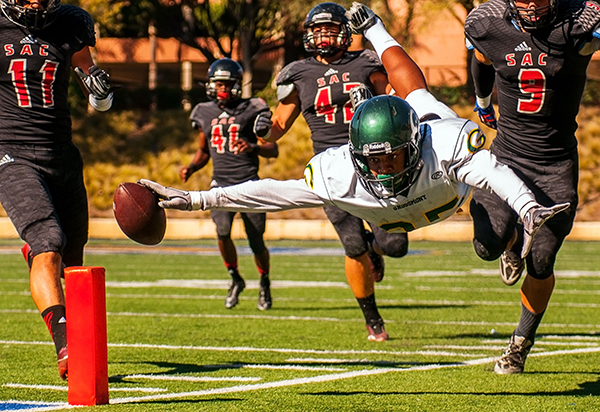 Brandon Means' photo of a Grossmont College receiver Paul Gooden diving into the end zone against Santa Ana College was selected the top image from Sports Shooter Academy XI. The COOLEST sports photography event of the year returns this fall. Applications are now being accepted for Sports Shooter Academy 12, Nov. 4 - 8, 2015 in Southern California. The Sports Shooter Academy is a hands-on workshop that emphasizes the involvement of the participants with the instructors in the field shooting events and during daily editing and critique sessions. The Sports Shooter Academy workshops are open to photographers and college students that want to be challenged to improve their photography, cover sports they may not have shot before, discovering new ways to cover sports they are familiar with, become inspired and receive critical analysis of their work. Covering real sports events in Southern California under the guidance of a faculty of award-winning photographers is the hallmark of the Sports Shooter Academy workshops. SSA 12 will have three full days of shooting. Sports events include: College football, soccer, basketball, volleyball, water polo and rugby. Also there are opportunities to shoot surfing and a local boxing gym. Each evening participants will edit their work and receive one-on-one critiques from the instructors. The workshop’s faculty are at all of the shooting events, answering questions, helping with remote camera installations, offering tips, suggestions and insights into photography and covering sports. Additionally many SSA Alums consider the daily one-on-one critique sessions the highlight of their workshop experience. The mantra and goal of the Sports Shooter Academy is: See better. Shoot better. "At the end of the day the work you make is only part of the picture. It is incredible to meet so many photographers who are passionate about photography and telling stories that involve sports," said freelance photographer Josh Barber who attended Sports Shooter Academy XI last fall. "Faculty and attendees alike there is something to be learned from everyone, and that doesn't stop on the final day of the workshop. You leave with many more talented photographers as friends than you came with." 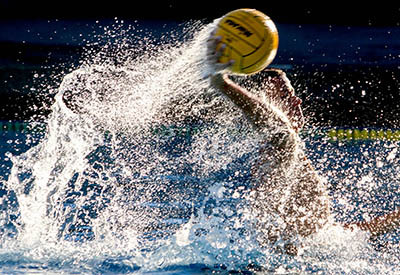 A player takes a shot during the Saddleback College - Riverside College water polo match at Sports Shooter Academy XI. While the Sports Shooter Academy is an intensive program, we emphasize participants to enjoy the Southern California experience, develop contacts and friendships ... and have FUN during this workshop. The workshop is truly an international program with recent participants traveling from Sweden, France, Canada, Australia and the U.K.
"Sports Shooter Academy XI was hands down one of the best experiences I have had in my photography career thus far," said college student Hailey Archambault. "For me the most important part of SSA XI was having professionals look at my work and tell me what I am doing wrong, or not doing, or how to improve. Absolutely invaluable." The Sports Shooter Academy was created by Matt Brown (Los Angeles Angeles of Anaheim director of photography) and Robert Hanashiro (USA TODAY staff photographer and Sports Shooter founder).